From Antwerp we caught an early afternoon train to Bruges. With our four large bags (after all we packed for an entire year), the train ride was mercifully short, and after a ten minute bus ride we found ourselves standing outside of our cute little AirBNB apartment. This time, the couple renting the apartment was living there at the same time, and we had to keep our voices down as the husband, who works during the night as a baker, was sleeping upstairs. Our room was light and sunny and had an inscription in Dutch across the wall opposite our bed. “Can you guess what it means?” our friendly hostess, Nicole, asked hopefully. No, Nicole, we actually have no idea what “Der libcht ist kommen der krigst von der stoumbuerg und diverscht der bonden roullenboulle” means. Sorry! It turns out to mean “Love is both the violence of the storm and the beauty of the rainbow.” Very nice. After Nicole gave us a brief orientation, we were on our way. As our guidebook aptly put it, Bruges is a beautiful, charming, and amazingly well-preserved medieval village – and everyone knows it. So it’s still all of those things, but unfortunately it is also filled with tourists and the inevitable tourist trap restaurants with absurd prices. Fortunately, we managed to have some authentic experiences due to the fact that everyone in this country speaks English and is just absurdly friendly. After wandering around for several hours past cathedrals, canals filled with swans and lined with weeping willows, we found a sign that said “beer tasting.” Up until this point, there were lots of places that served absolutely amazing beer, but nowhere allowed to you try flights. We entered the bar and quickly became friends with Jonas, the friendly goofball bartender and his over-his-head-and-out-of-his-league beauty of a wife from Morocco. Jonas taught us about different varieties of Belgian beer while Over and Out (I can’t remember her name) showed us stunning pictures of deserts and cities to see in Morocco. We will definitely be going there at some point on our trip as our first entrée into Africa. Africa seems like a good continent to play just-the-tip with before actually diving right in. For example: Brugesite: So why are you in Belgium? Laura: We wanted to see Belgium before arriving in Spain. Pause and stare from Brugesite. Brugesite: So…lots of time for WAKA WAKA, huh? Followed by hysteric laugher by all parties and gestures including the pumping both arms while thrusting hips. 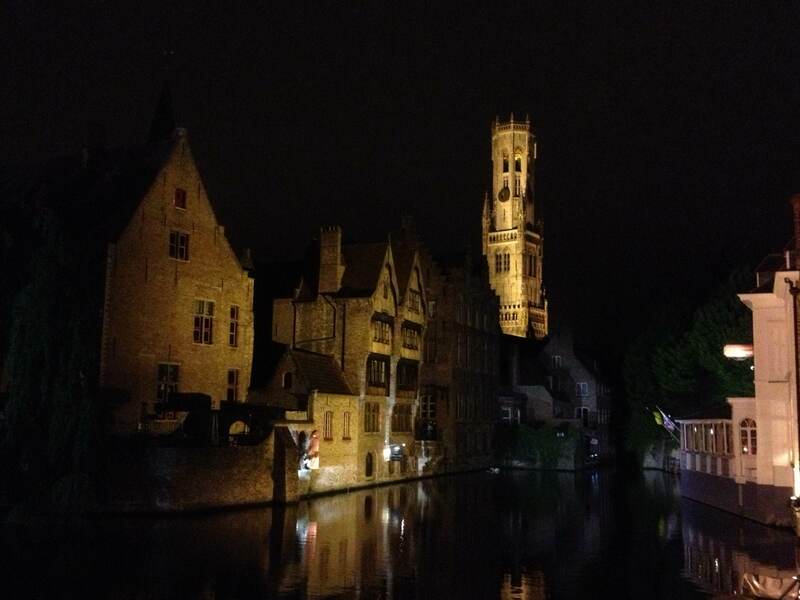 And a few minutes later: Brugesite: How long did your flight take? Laura: Actually we took a two-week cruise because it was cheaper than flying. Pause and stare. Brugesite: So, LOTS of time for… WAKA WAKA?! HAHAHAHA! And so on, ad infinitum, until basically all of us were shouting “waka waka” and cracking up while the other tables in the ungenerously-sized restaurant glanced sideways at us and inched their chairs in the opposite direction. After the shots and laughter about waka waka, they said “Now, we must have cookies!” To which I said: “I LOVE cookies, let’s go.” The women drove to the next spot while the two guys walked with us through the gas lamp-lit alleys of Bruges to an ultra-narrow alley where we walked down some stairs and found the cookie place. However, I had misheard. I thought we were going to eat cookies, but the reality was that we were going to a tapas bar owned by a tall and affable Belgian guy named Cookie. So instead of cookies, we ended up having yet another round of beers and making conversation with Cookie. Turns out the college-age daughter of one of the couples works at this bar and she joined in the party too. She speaks like five languages and is learning a sixth. Very impressive. This seems to be standard issue in Belgium. As an American trying hard to become just adequate at a second language, I was struck by the value of learning multiple languages early in school. And also struck at how hospitable the people are here. After that, more Waka Waka jokes ensued and the waka waka guy really loved it when Cookie’s girlfriend didn’t know what it meant. “I have Waka Waka every DAY, you should try it!” Thanks to Katty, Nancy, Eddie, and Bernard for a fantastic night, we really appreciate it! 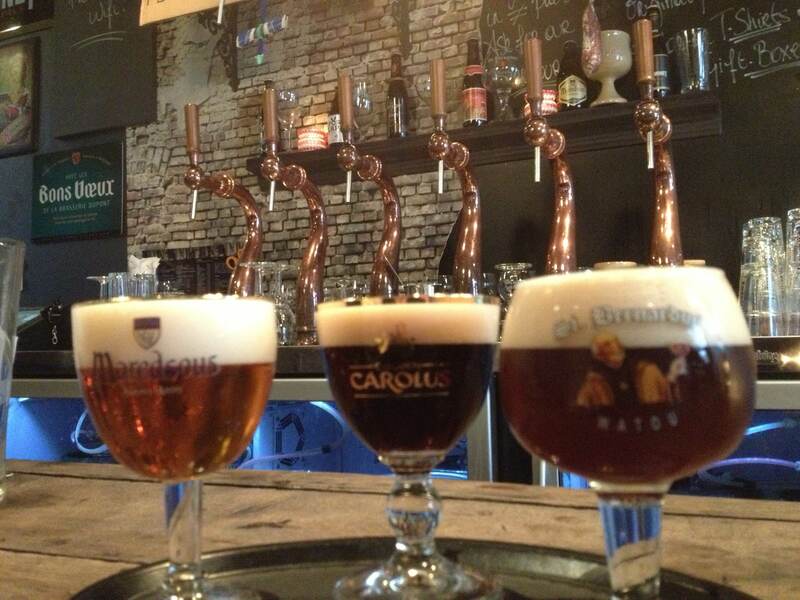 We won’t be forgetting our friends from Bruges any time soon! It was raining when we finally left Cookie’s (carrying the two free packages of shockingly good fresh-baked bread which he serves at his bar), so we took a taxi home and collapsed into bed. The next morning we woke up late and were greeted to a full breakfast spread by Nicole. Her husband, the baker, was already at work, but the fruits of his profession were spread all over the table in front of us. 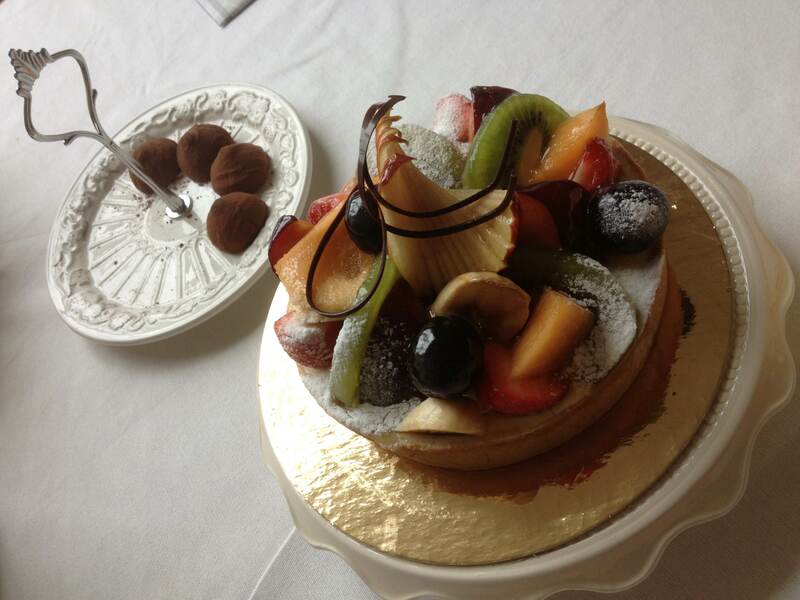 Benefits of staying with a baker! Fruit tarts, buttery croissants, and éclairs all disappeared into our mouths as Nicole launched into a two hour lecture about the history of Bruges. Fortunately, this history was interesting – although either way we were not in danger of falling asleep because, bless her heart, the historian Nicole speaks at volume 11. The whole time. 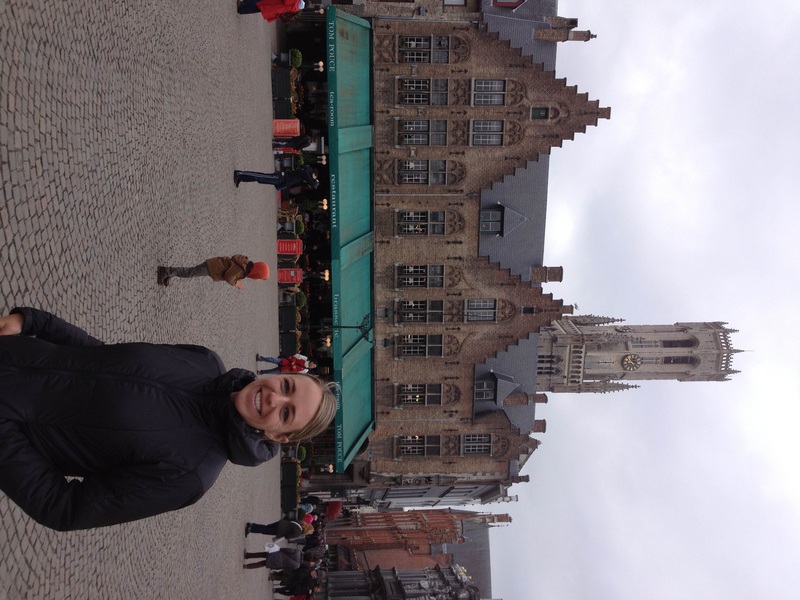 As educational words were blasted into our ears from Nicole’s powerful vocal chords, we learned that Bruges had been an economic center of Europe during medieval times because of its strategically important location on a major river. Those glory days lasted until a huge storm in the 1500’s reduced the river so that ships could no longer pass into the city. This led to the glory days of Antwerp, which lasted until the Dutch blockaded the river leading to Anwerpt, with the result being the start of the Golden Age of Amsterdam (this was not advertised in Amsterdam when they talked about their Golden Age). All this history made me confident that, being located on a huge bay, San Francisco’s current Golden Age will last for hundreds of years. Fingers crossed. 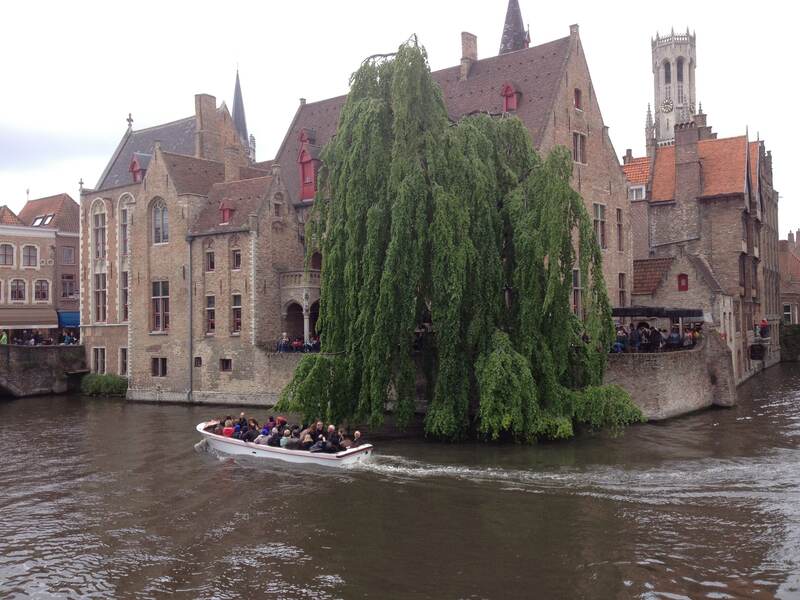 Anyway, Bruges is so well-preserved today because it declined so much after the 1500’s. Basically everyone forgot about it in Europe and nobody bothered to renovate anything, so many of the original buildings are still there. A Dutch guy around 1900 wrote a book called Bruges The Dead, and this was a big hit and kick-started what would be the saving grace of the city: tourism. 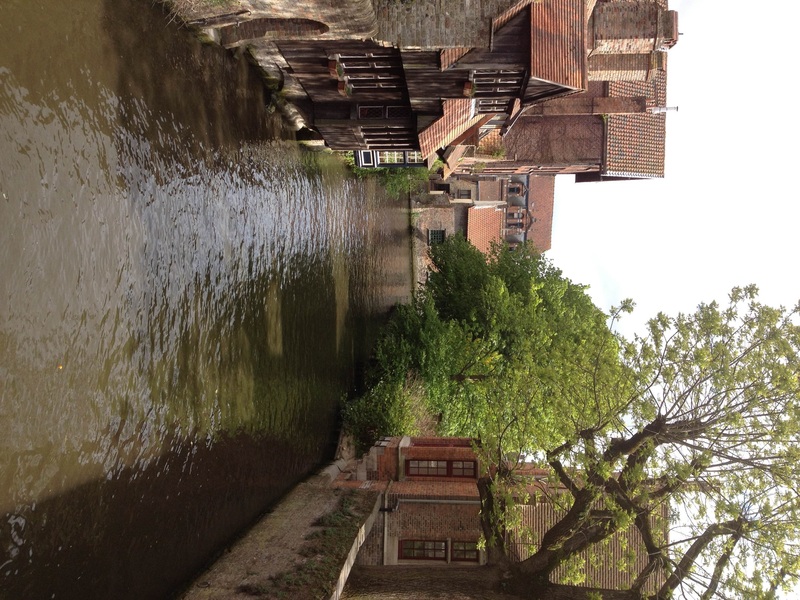 Everyone realized that Bruges was one of the last cities in Europe that looked like a real Medieval city and everyone wanted that authentic experience. The city has boomed commercially since then. 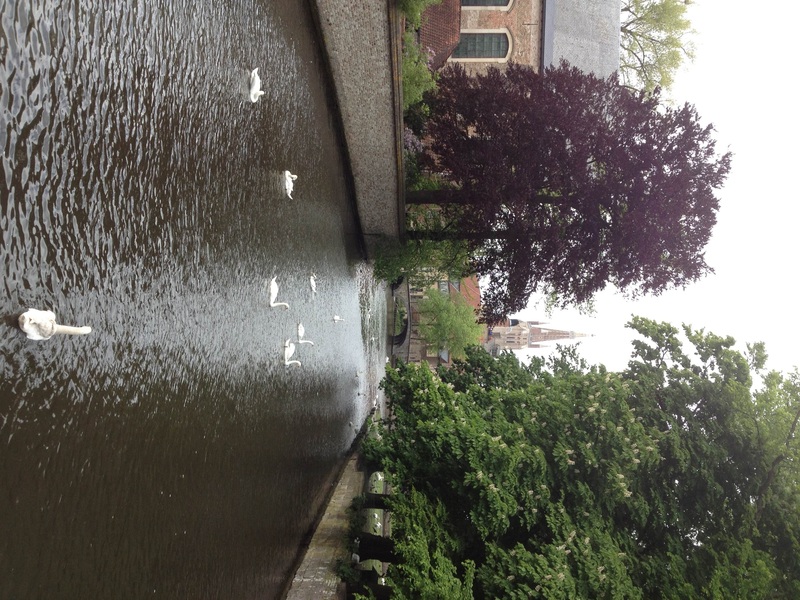 We also got some other high-volume tidbits: Bruges, by law, must always have 52 swans within the city limits to commemorate the unjust execution of a city administrator whose coat of arms had a swan on the front. And the term “city” is not just thrown around here, you had to be granted city status by the King and this meant that you could have markets and other privileges (who knew that having markets was a privilege? ), this could be revoked at any time if the King was displeased with you. The vast towers rising up over Bruges don’t just look awesome, they also served an important function as the communications hub of the Medieval period. The lookouts on the tower could ring a series of bells that could be heard from anywhere in the city walls and the bells could mean anything from what time it was, to the fact that the gates needed to be closed because invaders were on the way. It was like a type of early internet. Sort of. Great summary of an incredible night! Have fun (like I even have to say that)!! Disagree about L’Afrique. No need to tease. Just go b deep right away. See you in 2 weeks! Waka Waka men,it was a very nice night, a lot of fun we had and not forget every day WAKA WAKA.